Sometimes an experience is the best gift! 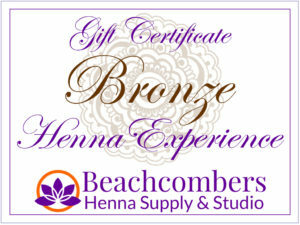 We make it easy to give the gift of a professional henna experience. 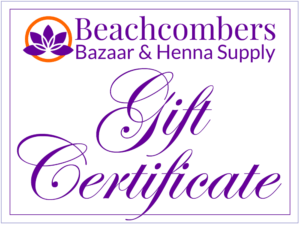 Buy online for a downloadable gift certificate or e-certificate! Both our Bronze and Silver level appointments are excellent gifts! 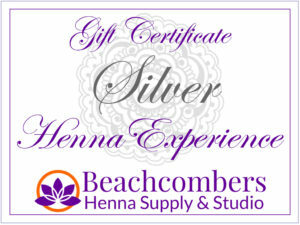 Scroll down below the purchase details for descriptions of each henna experience. 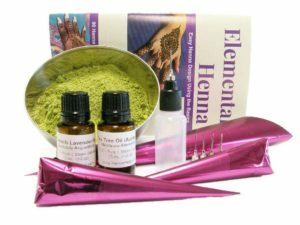 Click on this direct link to the Henna Experience listing on our shopping website. Select the Henna Experience level you’d like to purchase. Proceed to checkout and create an account. Account creation is mandatory to access the downloadable gift certificate. Print the certificate or save to your computer so you can print it later. Your Order Number MUST be written on the certificate once it’s printed. The certificate is NOT VALID unless you write the order number on it. This is an e-certificate. Nothing is physically mailed to you. It is designed to be printed on any standard printer. There is a space on the lower right hand corner of the certificate to write down the order number. Again, the certificate IS NOT VALID without an order number. If you are emailing this to the gift recipient, you must include the order number so they can write it in themselves. Nice sized design on one hand. Small designs on two hands. You can expect this to take 15-30 minutes including payment and consultation. One to three people maximum. The more people, the smaller and less detailed the designs. Perfect for two nice sized hand designs. Works well for two very simple hands and feet. Good starting point for shoulder or back henna. You can expect this to take 30 – 45 minutes including payment and consultation. One to four people maximum. Perfect for more intricate work or work that extends above the wrist. Two nicely designed hands or feet. Very simple belly (pre-natal) henna (this is not enough time for a full belly). Good for medium intricacy back designs. You can expect this to take 45 min to an hour, including payment and consultation. You can expect this to take 1.25-2 hours including payment and consultation. Bellies and crowns generally take longer. All appointments come with a short consultation before starting the design. You should assume you will be at the henna studio for 10-15 minutes longer than your scheduled appointment for consultation and payment. 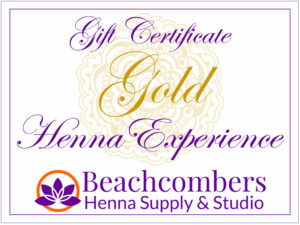 We also offer Gift Certificates to our website, www.ShopBeachcombers.com. These can be used online for ANY of our products and can also be used at our Orlando henna studio.